Some brief thoughts on the games I learned at PAX. 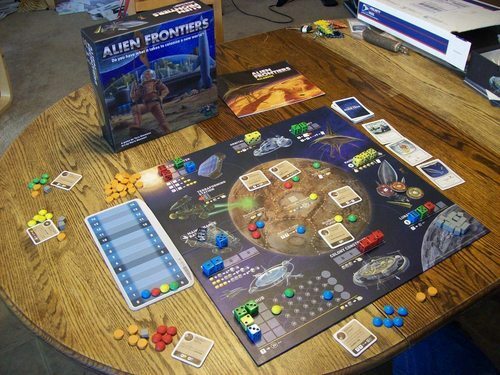 Alien Frontiers: I’ve heard a few raves about this worker-placement game, and jumped at the chance to give it a whirl during PAX. It is one of a number of newer worker-placement games that use dice as the workers, with the values determining what can be done with them. Along with the dice, Alien Frontiers adds another distinctly non-Euro element: “Take That!ism”. Some actions and cards allow a player to directly target opponents, allowing them to steal deresources or otherwise complicate their plans. I have no objection to this when it’s done well; Lords of Waterdeep, for instance, also has this element, and I quite enjoy that game. But in Alien Frontiers, it seems like it’s a little too easy to dogpile on the leader, such that all the players wind up within one point of victory and the winner is he who gets slapped down the least. Wondering if our one play was an anomaly, I checked out the comments by several reviewers I trust on boardgamgeek, and saw my concerns echoed: “seem to always come down to everyone just about winning”, “too much kingmaking”, “endgame is weak & incredibly swing-y”. Suspicions: confirmed! If I want dice-as-workers, I’ll stick with Troyes; if I want a little politics in my Euro, Waterdeep remains the one to beat. Dungeon World: I’m a sucker for both dungeon crawls and modern roleplaying games that put the emphasis on storytelling, so it’ll come as no surprise that I loved my first session of Dungeon World. The system, based on Apocalypse World, boasts several innovations, foremost among them the fact that the DM never rolls the dice. Instead, she sets up the situation (“the ogre swings his club at you”), and it is incumbent upon the player to drive the action forward, by taking “moves” (“I will attempt to Defy Danger by dodging out of the way”) and rolling two six-sided dice to determine the outcome. A 10+ means they accomplished whatever they set out to do; a 6 or less means they failed. But the fun of the game comes when a move roll results in a 7, 8, or 9, at which point the DM gets to decide what “partial success” looks like (“you can either: take the blow and full damage, or block with your sword arm, taking less damage overall but losing the use of your arm for the rest of the fight”). No doubt my favorable impression of the game was due in part to Brendan Adkins, our excellent DM, but I really think the game works well as a rules-light D&Dish RPG, perfect for those who prefer storytelling to min-maxing. Pathfinder: The Adventure Card Game: This was the belle of the ball at Gen Con, and it’s easy to see way: hugely popular RPG theme (dungeon crawl) + hugely possible RPG license (Pathfinder) – the need for a DM. Like the roleplaying game on which it is based, P:TACG has a party of adventurers cooperating to explore, fight monsters, acquire loot, and ultimately confront a villain of some sort. Normally one player would have to run all this, but here everything is automated, and the players work collaboratively to beat the system itself. 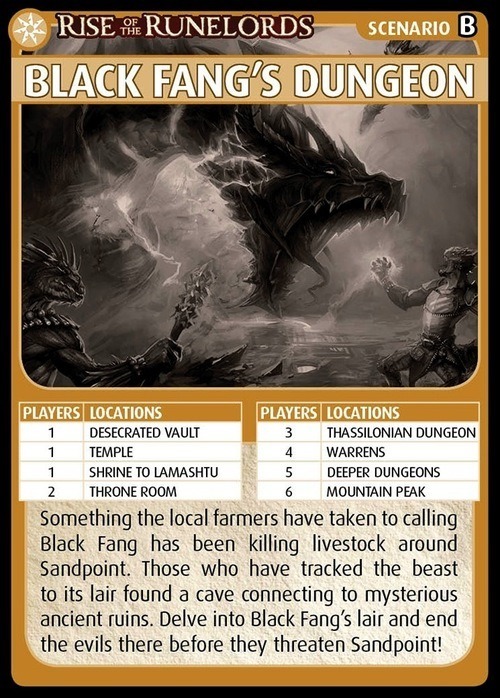 A scenario has a number of location, each with it’s own draw deck. On a turn a player picks one of these locations and explores it, revealing and encountering the top card from its deck. Some of the encounters are Boons that a player can acquire, such as weapons, items, allies, and blessings; others, like monsters, are Banes, and the player must overcome them. In either case, the player rolls against one of his skills to determine success. 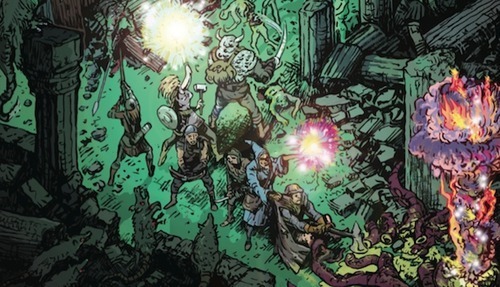 When a deck is exhausted, the corresponding location is “closed”, and the adventurers move on to another of the sites. The overarching goal is to to flush out and defeat the scenario’s Big Bad. Some of this is standard deck-builder fare, but P:TACG offers several novel twists on the formula (including a hand-size mechanic that is downright elegant). The biggest draw of the game, however, is that state persists from game to game; that is, if you acquire a sword or an ally or an item in one game, you can start the next game already owning it. Your characters also level up as they would in a RPG, so you slowly become more powerful and better equipped over the course of several sessions. You can play one-shots of course, but the game is really designed for a dedicated group, with players using the same characters for each session, and working their way through the Scenarios that compose the Adventures that compose the Adventure Paths. A member of my game group picked up a copy of P:TACG, and we are in the process of setting up a monthly Pathfinder night dedicated to playing it. That probably tells you all you need to know about the game’s allure and potential. Sentinels of the Multiverse: Last year a reader wrote me of the blue to recommend Sentinels of the Multiverse, which he described as “a cooperative superhero card game in which up to 5 players work to defeat a supervillain”. “Superheroes” and “cooperative” piqued my interested, but upon further investigation I came to the (erroneous) conclusion that the game was a deck-builder, a genre for which I have little enthusiasm. Even that wouldn’t have stopped me from buying it though, as I will act on pretty much any recommendation, but I also couldn’t find the game for purchase anywhere. It appeared to have been a Kickstarter project that was not generally available. Since then the buzz around Sentinels has grown (it has been suggested to me several times in the last six months), so I picked up a copy at PAX, and am very pleased to have done so. The core game is fairly simple, with the players attempting to reduce the Villain’s Hit Points to 0 before he knocks out all of the Heroes, or before time runs out. To that end, cards are played that deal damage, or heal damage, or have a variety of other effects. The cooperative element of Sentinels elevates it above standard “Take That!” fare though, and many cards amplify or modify the effects of others. On my turn, for instance, I might play a card that reduces the Villain’s Hit Points by 3, or I might choose to instead play a card that adds 1 to the damage dealt by every other player until my next turn. Some cards remain in play and have lasting effect, such that, as the game goes on, the options available to players grow, as do the opportunities to clever, synergistic plays. Much of the fun of the game comes from working with the other players to find and exploit powerful, cascading chains of effects that will wreak havoc on the Villain’s plans. Sentinels is often likened to Magic: The Gathering, not only because cards interact with one another in interesting and powerful ways, but also because each player has a unique deck with an overarching “theme”. Some of the heroes deal large amounts of damage but can do little else; others specialize in weakening or undermining the the Villain rather than hurting him outright. The hero I played in my first game was Legacy, a quintessential team player, who could redirect damage meant for others to himself, and often chose to assist his fellow heroes rather than bask in the spotlight. 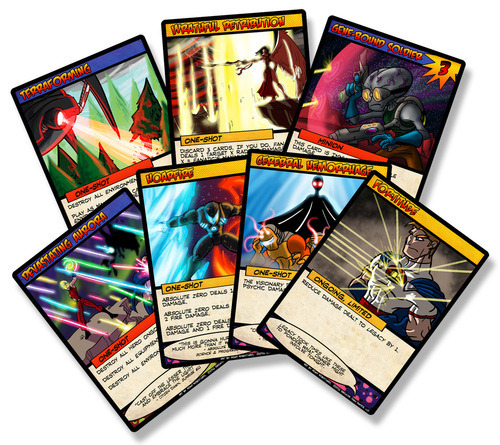 With 10 different Heroes and 4 Villains (each of which also have their own decks and specialties), there are lots of combinations to explore as you play through a comic book series of your own making. This post is part of the H. P. Lovefest. 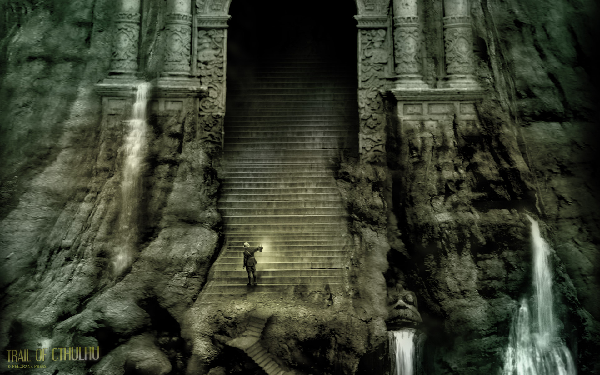 TL;DR: I have rapidly become a fan of the Trail of Cthulhu roleplaying game, a modern, player-facing alternative to Call of Cthulhu that highlights the investigative aspect of Lovecraftian adventuring. I’ve always loved all kinds of games, but the frequency at which I played RPGs was, until recently, about once a decade: a handful of D&D sessions as a kid, an afternoon of Top Secret in high school, a GURPS session in college, and a taste of Call of Cthulhu in my early 30s. Of the many systems I’ve learned (and the number I’ve learned is an order of magnitude greater than the number I’ve played, alas), Call of Cthulhu (CoC) was by far my favorite. Not only am I a sucker for the horror genre in general, and H. P. Lovecraft in particular, but I also appreciated the game for putting the narrative front in center, with the dice relegated to a supporting role. A few years ago I picked up a copy of Trail of Cthulhu (ToC), knowing full well that, like dozens of other RPGs I have purchased over the years, it would be read but likely never played. But the system appealed to me to such a degree that I decided to actually try it out. And so, on Halloween of 2011, I gathered several of my friends and subjected them to the eldritch horrors that the game has to offer. The evening was so successful that I have run the game several times since, for a variety of friends and acquaintances. It’s with thanks to ToC that I can, at long last, add the title of “roleplayer” to my gaming resume without resorting to exaggeration or wishful thinking. Why did I enter the world of roleplaying with Trail of Cthulhu, rather than in the company of its much lauded forefather? Because ToC emphasizes the investigative aspect of the game, which I find to be the most fun. 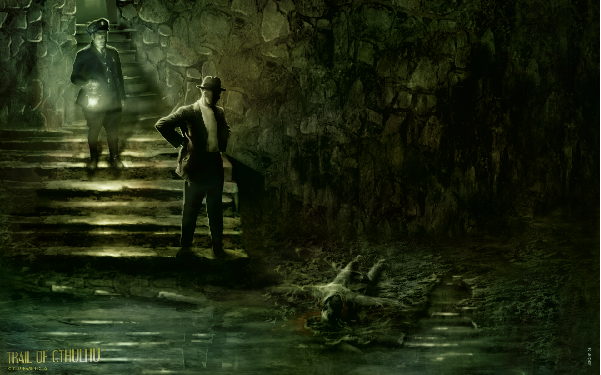 In fact GUMSHOE, the engine thrumming within ToC, is specifically tailored for mystery-oriented RPGs, and the exploration of Lovecraft’s horrors is but one of its many application. GUMSHOE is built around a simple proposition, albeit one viewed as heretical by many Call of Cthulhu fans: characters in an investigative game should be given the clues for free. In other words, players need not “Spot Hidden” to find the essential manuscript, pass a “Listen” check to hear the scratching behind a secret door, or miss out on a key piece of information because they failed to interrogate a wino four scenes back. If an Investigator is in a location containing a clue, and has a skill appropriate for finding it, the Keeper forks it over. No dice rolls, no chance of failure, no games derailed for want of a well-hidden journal. GUMSHOE accomplishes this by dividing an Investigators skills into two broad classes: Investigative and General. Investigative Abilities, such as Occult and Flattery are those that enable players to learn things, and work automatically. If a character in the story has information and is susceptible to flattery, for instance, a player need only declare that they are laying on the charm to get the goods. General Abilities like Firearms and Fleeing, on the other hand, are those that enable players to do things. Unlike Investigative Abilities, General Abilities require a dice roll, and can result in failure. So while finding the combination to the safe is a given, sneaking past a rogue shoggoth is not without risk. Some Call of Cthulhu players find this to be even more blasphemous than the creatures they face. Finding clues is the entire point of a mystery they argue, and removing that element neuters the game. The creators of GUMSHOE beg to differ, and cite as evidence for their position the traditional police procedural, where the finding of the clues is a given, be it Sherlock Holmes spotting mud on a suspect’s shoe or the CSI team sweeping a motel room for DNA. The interesting part of the story, they posit, is in the interpretation and synthesis of the clues, as the detectives move from scene to scene drawing ever closer to their quarry. GUMSHOE works by deprecating the drudgery of evidence collection and highlighting the fun of piecing together the Horrible Truth. With Trail of Cthulhu, Kenneth Hite takes the GUMSHOE system and plunks it into the world of H. P. Lovecraft. Hite has an impressive resume in both RPG creation (he is credited with GURPS Horror) and the Mythos (on which he has written several books), and his considerable experience is obvious in the design. The first 80 pages of the book are essentially Hite’s conversion of Call of Cthulhu to the GUMSHOE system. Yes ToC is its own game, but there is no way (nor need) to deny CoC’s omnipresent influence. PCs are called “Investigators” and the GM is the “Keeper”; many of CoC’s signature skills (e.g., Credit Rating and Psychoanalysis) have been carried over; and yes, characters have a Sanity rating, which will erode over the course of several games. Hite augments all this with a number of innovations. Stability, for instance, is a measure of an Investigator’s short-term mental well-being, and can be refreshed by completing adventures, finding safe haven, via the application of Psychoanalysis, and so forth. 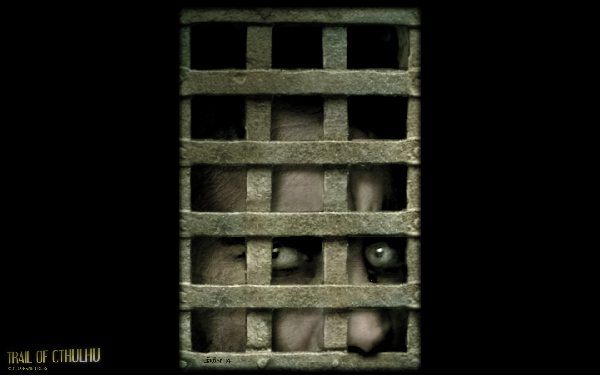 (As in CoC, however, Sanity tends to be a one-way street toward madness.) Investigators also have built in motivators, including Drives (Curiosity, Ennui, and other explanations as to why they investigate the Mythos) and Pillars of Sanity (core beliefs, such as “Science trumps superstition”). The Great Old One Ithaqua, the Wind-Walker, dwells in the Arctic wastes. It abducts lone travelers or those who have attracted its unfavorable attention, carrying them off into the auroral skies. They are found weeks or months later, frozen solid in positions of great agony, missing random body parts, and partly buried in the ground as if dropped from a terrific height. Ithaqua resembles a gigantic (even miles-tall, although this may be a cold-induced hallucination) humanoid with ragged stumps at the end of its trailing legs. Its eyes glow a lambent red. This appearance matches the descriptions of the Wendigo, the legendary man-eating monster of the Chippewa, who inspires cannibalism in those who encounter him. Ithaqua, likewise, sometimes transforms its victims into its own semblance, leaving them insensible to cold. Ithaqua is an Outer God embodying the inevitability of thermodynamic decay. As time increases, molecules get colder and more isolated – the Arctic north is the coldest, most isolated part of the human world, a preview of the “heat death” coming for us all. Ithaqua causes, or is, or is created by, that immovable truth. Chock full of ideas like the above, the Trail of Cthulhu book will be of interest to anyone fascinated by the Mythos — even those who have no intention of ever playing the game. Dice rolls are rare but meaningful: As I mentioned above, Investigators need only roleplay the use of their Investigative Abilities to receive the clues necessary to proceed. 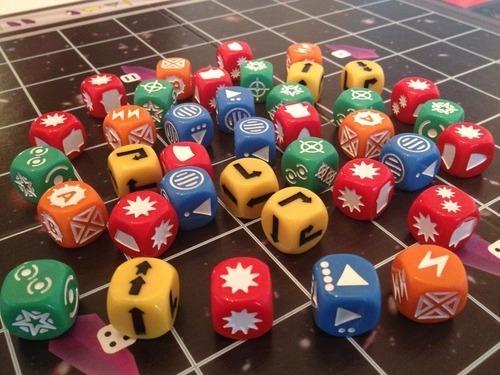 Dice rolls are required when a character invokes a General Ability, such as Firearms or Fleeing, and failure usually results in a significant setback or injury. Furthermore, all rolls are made using six-sided dice, and the results are dead simple to interpret. Sessions are concise: A session of ToC tends to be briefer than it would have been if played using the CoC ruleset, as dead ends are eliminated, clue hunts are minimized, and the action isn’t continually interrupted by dice rolls. I have played some ToC adventures in a single evening that surely would have required two or three sessions using CoC. The game is player-facing: I’d never heard the term “player-facing” prior to ToC, but the term perfectly encapsulates much of what I like about the game. In most old school RPGs, the GM “runs” the game and the players deal with whatever is thrown at them. In ToC, however, the players are active agents, and one duty of the Keeper is to react to their choices, weaving the elements introduced by the players into the narrative. For instance, each Investigator has points that can be used on investigative “benefits” (e.g., an additional clue, or a contact in the city that can aid the team). The players not only chooses when to spend these points, but can suggest the nature of the benefit received. The Keeper is the final arbiter of course, but this gives the players much more say in how the story unfolds. Floating Clues: ToC encourages Keepers to have a stash of extra clues on hand. If the Investigators decide to do something that is not in the script — search the lighthouse that was only meant as scenery, say — the Keeper can reward their initiative by giving them something for their trouble. It’s another manifestation of the player-facing nature of the game, rewarding Investigators who stray from where they are “supposed” to go. Purist Mode: Most CoC adventures are pulp in nature, allowing players to confront and even defeat gods. ToC allows for this style of play as well, but also introduces Purist rules that remain true to the spirit of H. P. Lovecraft stories. If you like your adventures lethal and your outcomes bleak, this is the mode for you. I’m a fan of Trail of Cthulhu, and unsurprised that it’s the game that finally turned me into a roleplayer. The system not perfect, and there are aspects that I find odd or unworkable. The point-spend mechanism is a marvelous idea as it ensures that all players get their moment in the spotlight, but often feels clumsy and disruptive in play. The game can careen from diceless to dicefest when group combat erupts. And the soft- and hard-driver rules, where a player can be punished for not roleplaying an Investigator the way the GM feels it ought to be played, as so counter to the spirit of the game that I’ve simply chosen to ignore them. Some critics question why ToC exists at all, since Call of Cthulhu Keepers who prefer player-facing games have long used floating clues and the other “innovations” championed by the system. That is undoubtedly true, but by codifying these mechanics Trail is a boon for novice Keepers who might otherwise struggle with these elements. And while you could play any ToC adventure using the CoC ruleset (and vice versa), the systems lend themselves to different styles of play. 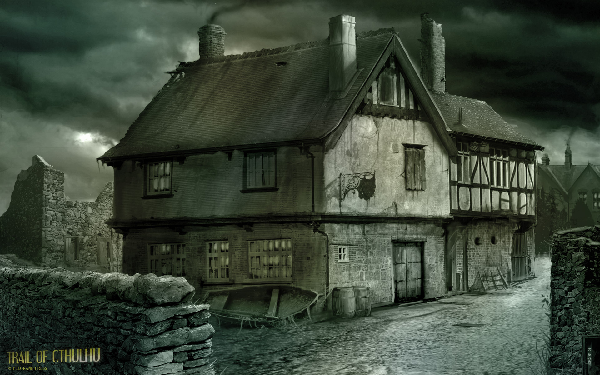 Take the Call of Cthulhu game I participated in last Saturday, a “haunted house” scenario in which the players were confined to a mansion and bad things happened to them over the weekend. Although our party was ultimately successful, we missed several clues because we’d neglected to search some key locations. That wouldn’t have happened with ToC, as Investigators always get all the core information. But ToC also favors stories in which the players travel from scene to scene, following clues toward a destination (hence the “Trail”). It is also ill-suited to adventures in which the players are not actively trying to solve the mystery; without the investigation, Trail flounders. So while there is a great deal of overlap between CoC and ToC, neither is obviated by the other. If you are currently enjoying CoC I see no reason for you to switch. But if you are interested in a new approach, or new to Lovecraftian roleplaying and wondering which system to adopt, give Trail of Cthulhu a read and see if it models the sort of play you prefer. It certainly does for me. You can learn more about Trail of Cthulhu at its Official Homepage, RPGGeek, and on the Yog-Sothoth forums.